THIS BOOK IS THE ENGLISH TRANSLATION OF THE 2ND VOLUME OF BOOK WRITTEN BY DR.TSERING NORBU IN TIBETAN TITLED " BOD LUGS GSOBA RIG PA'I SKYE DNGOS SMAN RDZAS SNGO 'BUM KUN BTUS " AND TRANSLATED BY DR. TENZIN ZOMPA AND DR. TSERING SAMDUP. 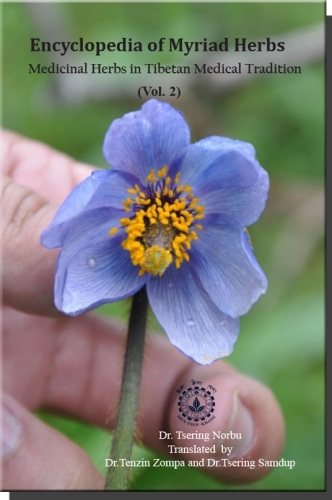 ITS TIBETAN VERSION IS PUBLISHED BY THE MATERIA MEDICA DEPARTMENT OF MEN-TSEE-KHANG, DHARAMSALA IN 2016. 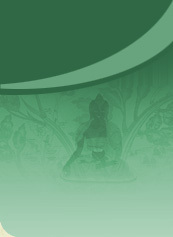 IN THIS ENGLISH VERSION, THE CONTENTS ARE ARRANGED ALPHABETICALLY AND THE BOOK CONTAINS 360 MEDICINAL PLANTS OF FIVE CLASSIFICATIONS SUCH AS HERBS, TREE, THANG-SMAN, CEREALS AND AROMATIC PLANTS WITH THEIR NAMES, SYNONYMS, CLASSIFICATION, CLASS OF MATERIA MEDICA, HABITAT AND ALTITUDE, PART USED, PERIOD OF COLLECTION AND METHOD OF PROCESSING, TASTE AND POTENCY, AND MEDICINAL USES. 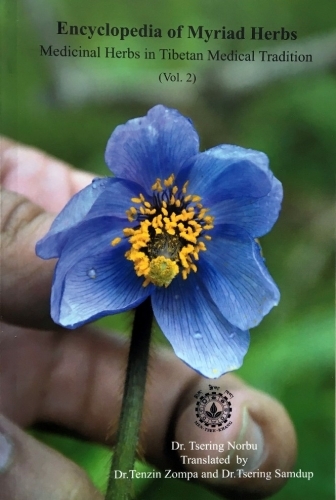 IN PARTICULAR IT ILLUSTRATES THE MEDICINAL PLANTS WITH 366 OF THEIR IMAGES WHICH BENEFITS SIGNIFICANTLY FOR THE PURPOSE OF IDENTIFICATION. ALONG WITH THAT IT CLEARLY DESCRIBES THE CONCEPT OF POTENCY AND QUALITY OF FIVE COSMO-PHYSICAL ELEMENTS, WHICH IS THE FOUNDATION OF EVERY ANTIDOTES OF ILLNESS, WITH PICTURES AND DIAGRAMS.